This is one of the most asked questions I get from people who want to propose in Orlando but they don’t know where to propose! I figured why not include a post that includes my recommendations? Well, here are my personal opinions! Keep in mind that everyone is different, and to every person a place has a certain meaning to them, whether its Disney because it was their first date, or Lake Eola because that’s where they took a stroll where they asked the second most important question in their relationship. Well, folks here are some recommendations that would help you begin your journey to marriage! The reason why I highly recommend this resort is just the many possibilities of where to propose! 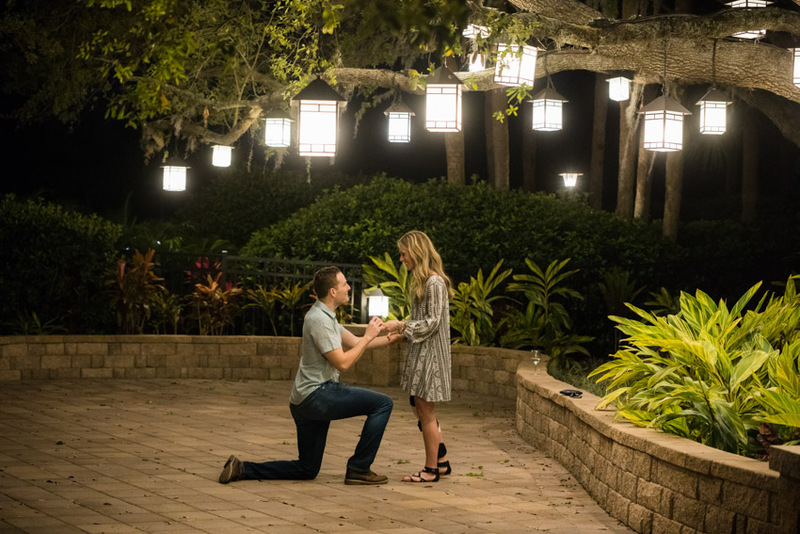 Whether you want to propose on a beach, a waterfall or under lit lanterns, this resort has all of that! 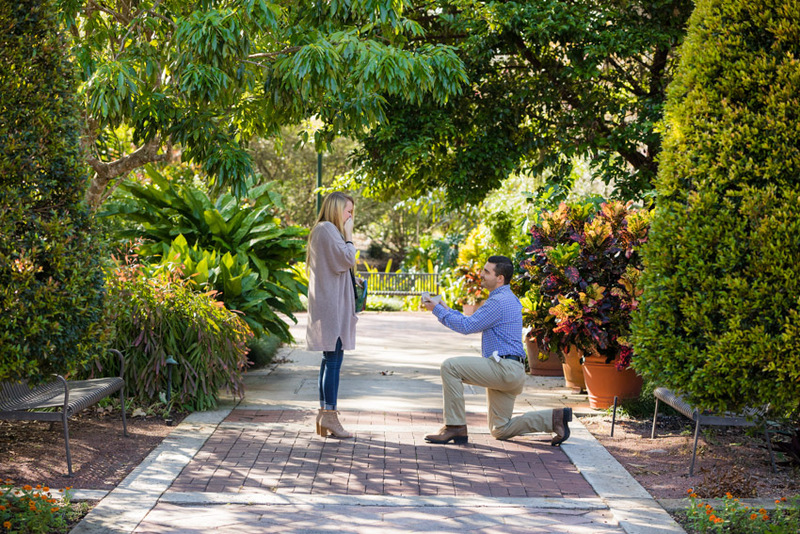 Then after your proposal the portrait session when it comes to scenes and backdrops, the possibilities are endless when you have the right photographer! I totally love the Disney Fireworks Cruise due to the fact that you have the whole boat to yourself well except with me and the Captain! But other than that, its a lot better than being around so many people in the park when you ask one of the most important questions in your life! This option is totally a must if you and your other half desire privacy without others watching. This park is a local fave where locals alike come here to dine shop and hang out with friends and family! This park is also home to many couples’ first dates and it is one of our highly requested spots! If you do want the park setting then Lake Eola is the place to do it! 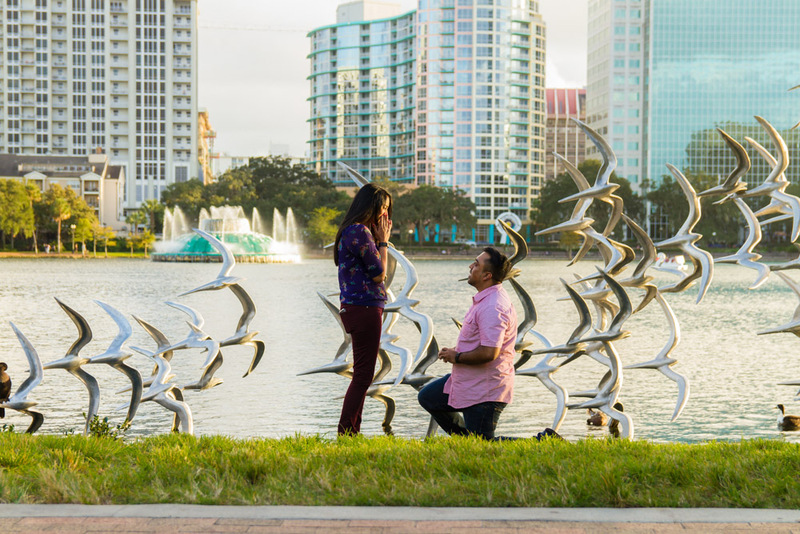 We highly recommend either you propose on the peninsula with the backdrop of the fountain or in front of the Take Flight Art piece that has a beautiful backdrop of Downtown Orlando! Ceviche is a beautiful Mexican tapas restaurant on Church Street that is well known for weddings, special events and its scrumptious food! 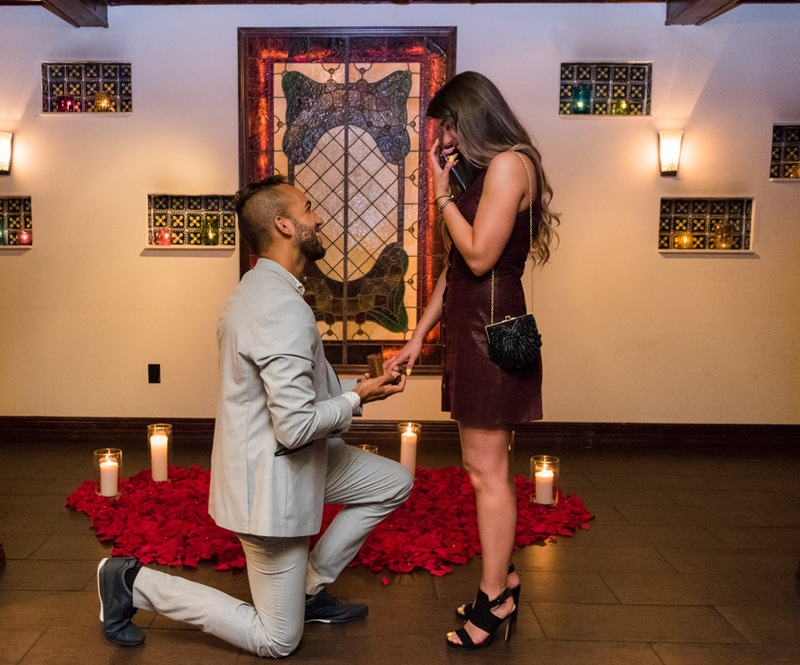 They also are great to plan for your proposal and will plan with you (or we can plan for you) of how you want your proposal to play out whether an intimate room or outside under the Church Street Station Bridge, Ceviche is just picture perfect for that! The Waldorf Astoria is a beautiful property that is located right in the heart of Disney! With elegant decor and a classy setting, if you’re looking for a more upscale way to propose, then this place is more for you! 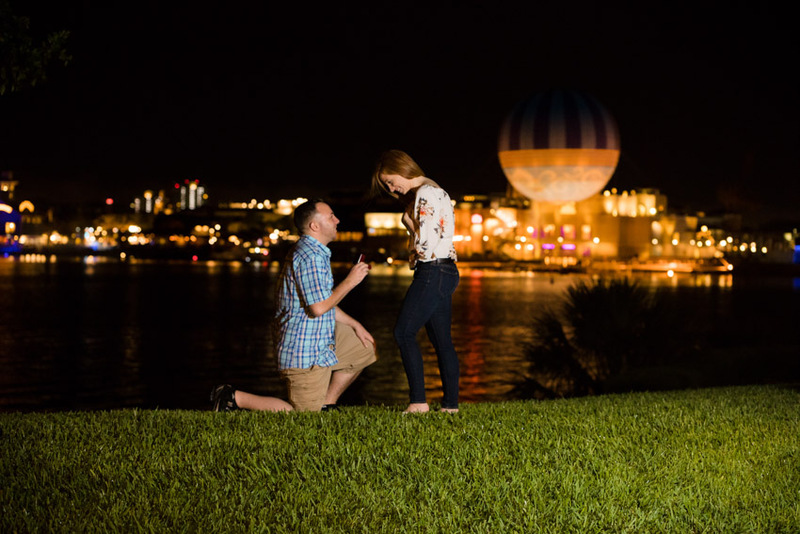 Places to propose is the clock in the lobby in the evening (not during check in time) or outdoors with the resort in the background. Leu Gardens is another local hidden gem! Even tourists are finding out about these gardens by searching it on Google! The real reason why I love Leu Gardens is just the vast size of the gardens itself! This means plenty of backdrops and scenes that would fulfill your pinterest needs! The gardens are also the biggest in the state of Florida when it comes to acres! This beautiful Disney resort has it all from a wonderful carriage ride to a big pool to wonderful restaurants! If you desire that New Orleans Southern Decadence vibe, then this is your place to pop the question! Our recommendation is to take a carriage ride and then request to be dropped off at Magnolia Gazebo so when you propose you have the carriage in the background! This attraction is known for its sky-high views and takes around 20-25 minutes to go around from bottom to top! Make sure when you book the attraction, make sure you book the private capsule which also includes champagne/alcohol to celebrate the moment! 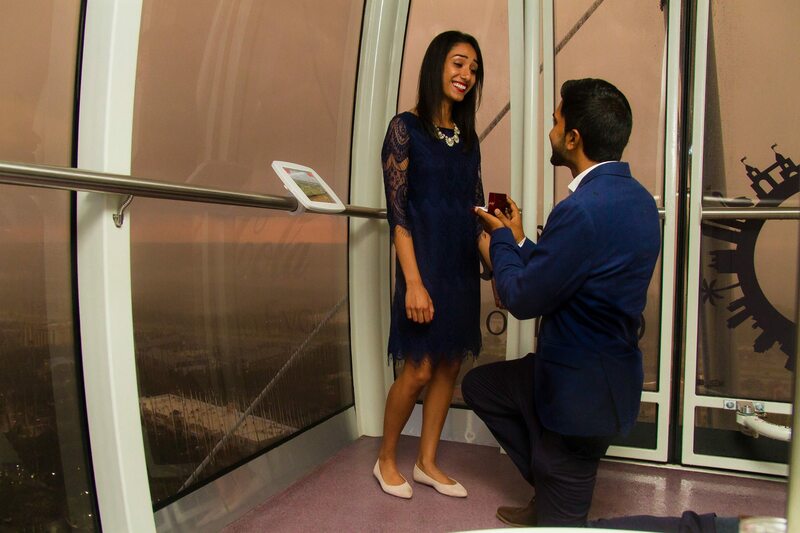 Also we recommend you book 15 minutes before sunset and propose when you reach the top! While Disney Springs is bustling with shoppers, there are beautiful spots right on the Westside where you can avoid the crowds! 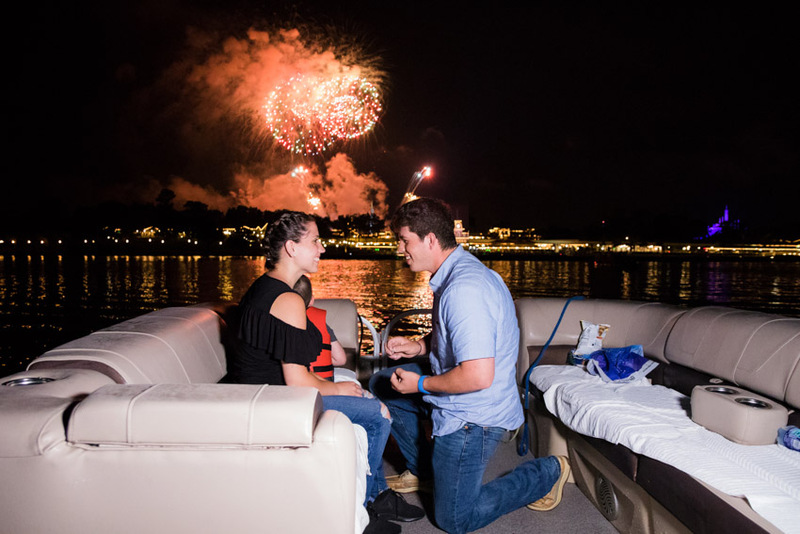 This is also a must if you desire a private moment along with a beautiful backdrop of Disney Springs! Some of you wonder why Animal Kingdom is on the list, well if you’re an animal lover, it’s a no-brainer! Especially if you’re in love with animals or your profession is with animals, this park is just perfect! 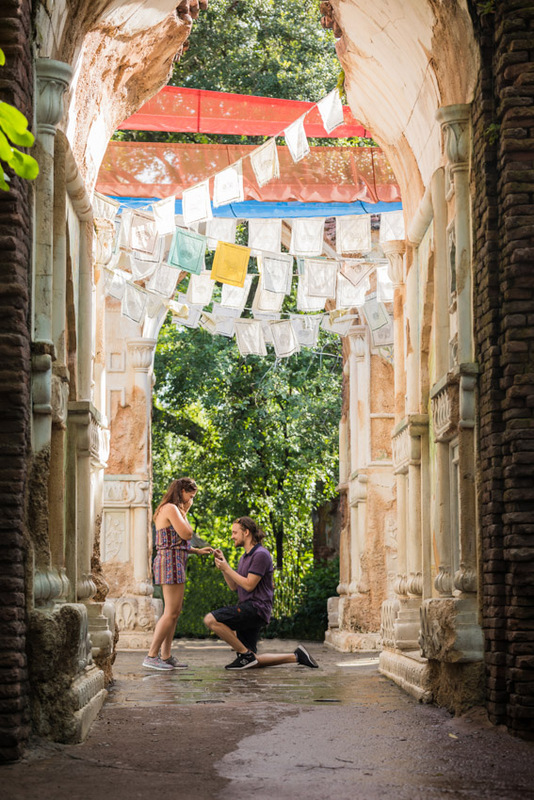 We highly recommend your propose at the Maharajah Jungle Trek under the flags where you can propose without a person in sight along with a gorgeous magazine worthy backdrop! 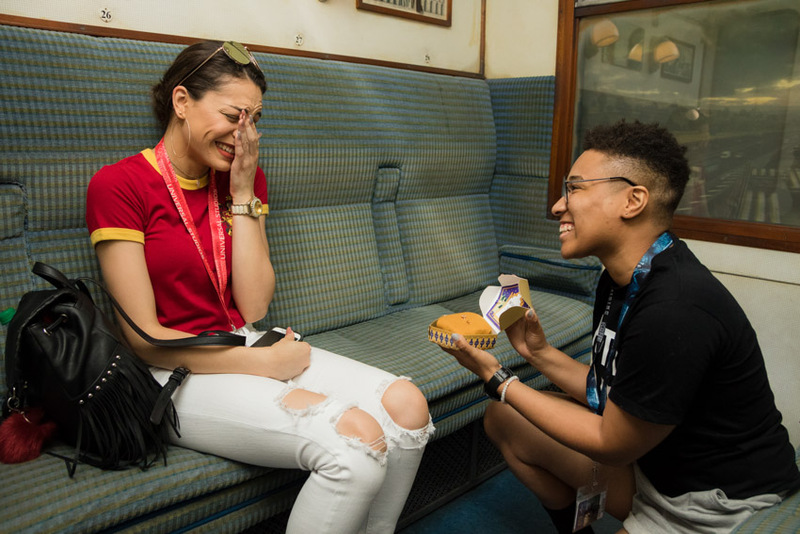 If your other half loves Harry Potter, then this is the place to pop the question. 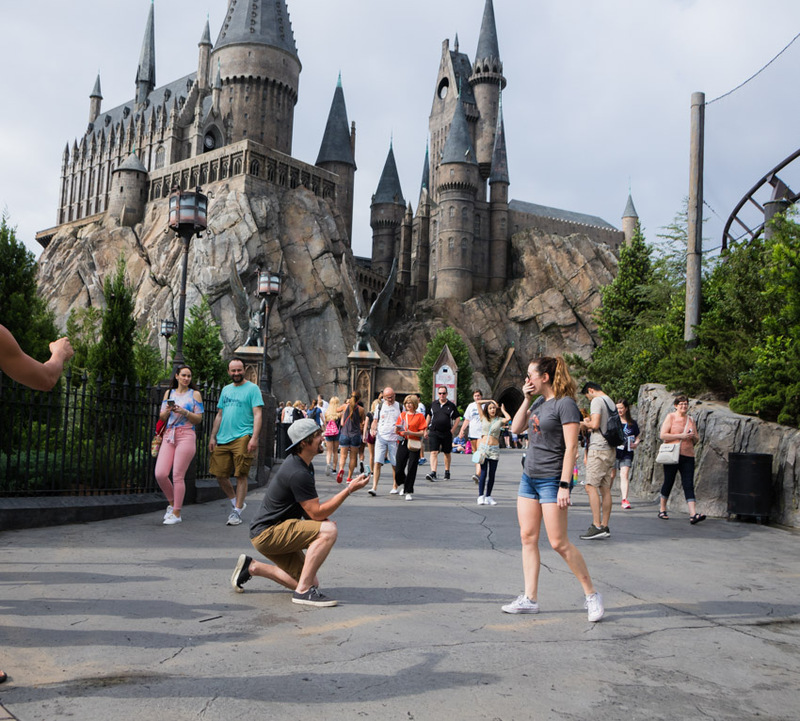 From the friendly staff to awesome scenes and backdrops, this park fulfills any Harry Potter desires for photos! 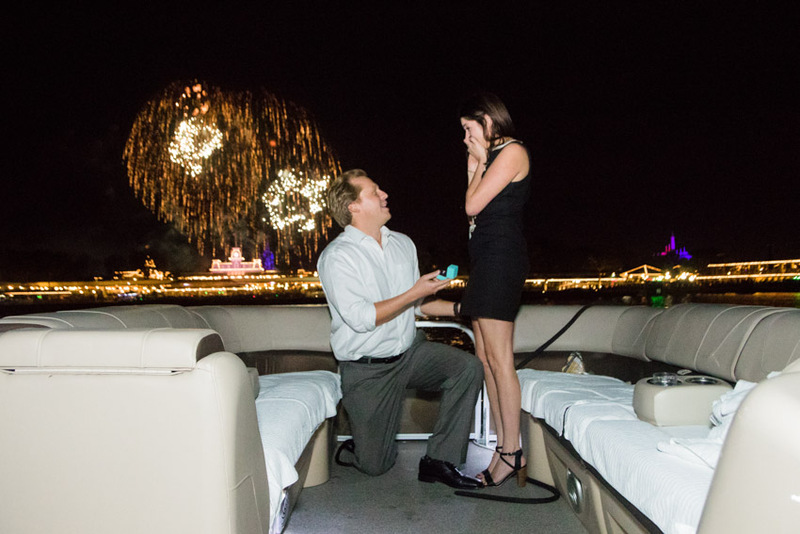 Due to the high traffic in the park we recommend you propose in the morning when the park opens! 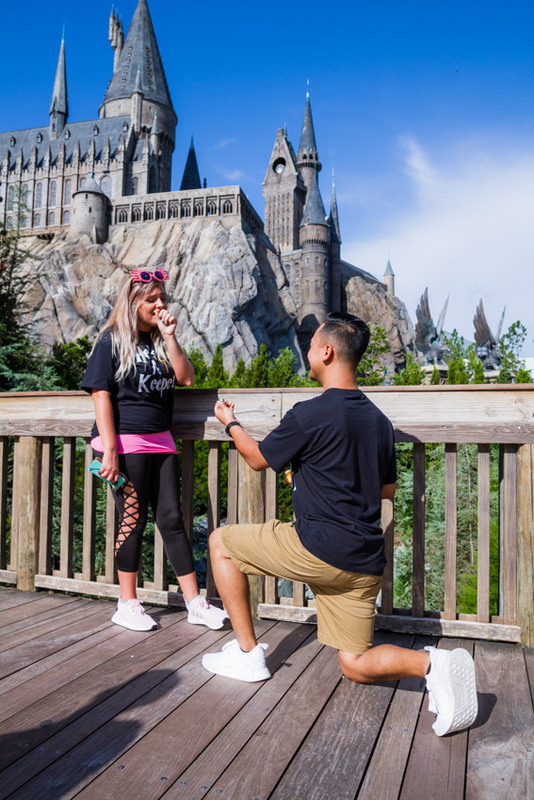 Places to propose is either the bridge that faces Hogwarts or right in front of Hogwarts for the best backdrop possible! Hogwarts is located on the Islands of Adventure side of Universal Studios! 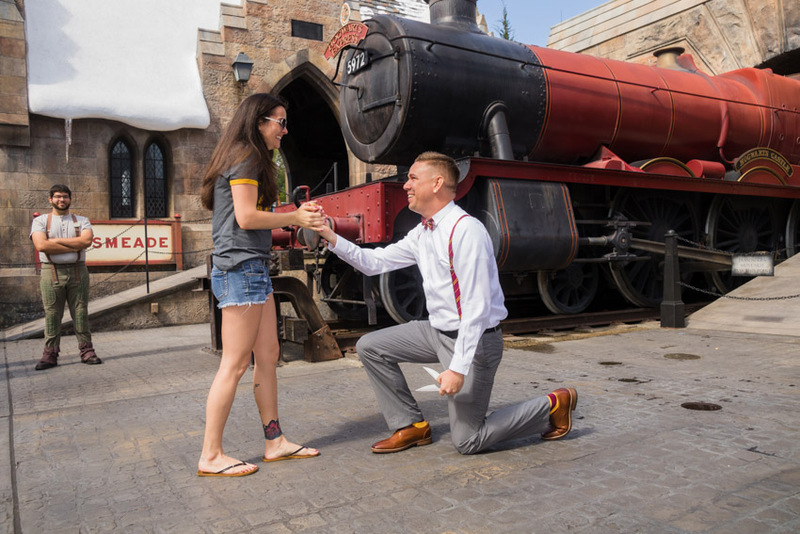 One more backdrop idea is in front of Hogwarts Express if he/she loves trains! As they say this park is the fairest of them all! 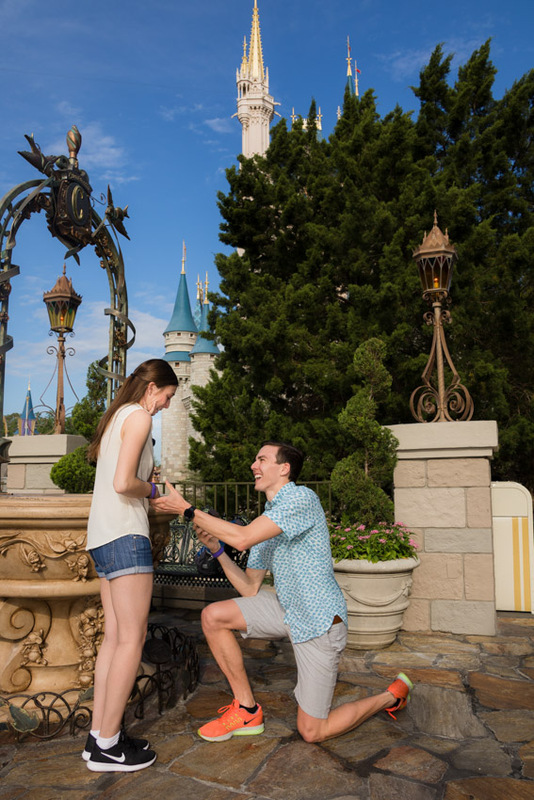 Cinderellas Castle is one of the most Instagrammed iconic proposal spots that every princess could desire. 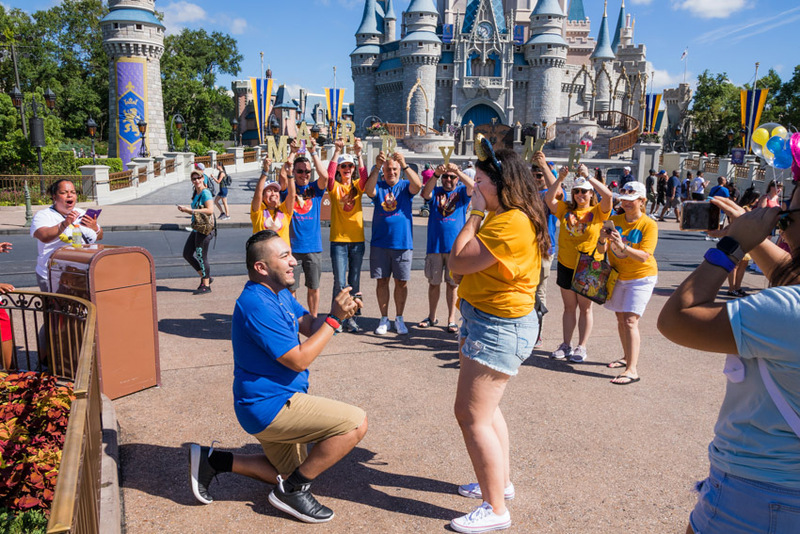 However we recommend you either propose right in front of the castle in the morning (check the schedule to make sure any shows aren’t going on when you pop the question) or the sides of the castle for less traffic. 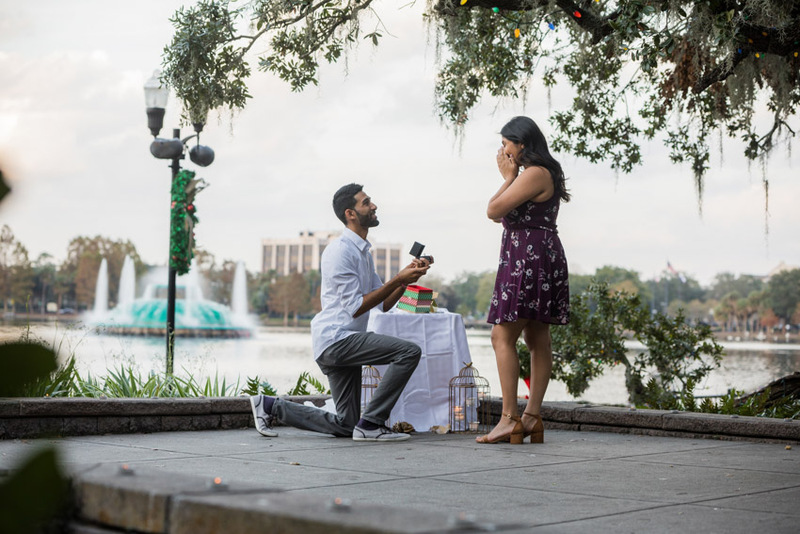 In the morning and the off season (Winter) is going to be your best friend if you choose to propose at the fairest park of them all! 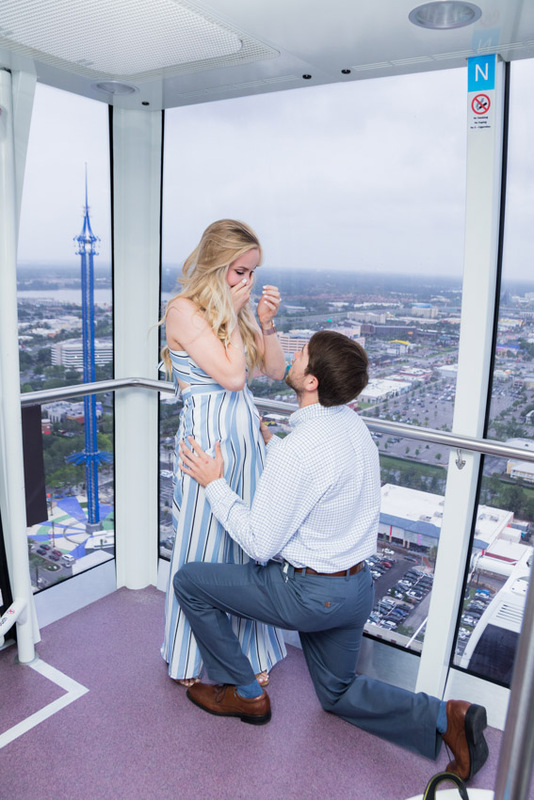 We certainly hope this helps you in your proposal adventure and if there’s any questions feel free to shoot us a message and we can gladly help!